FFA members throughout U.S. focus on heightening awareness of FFA, agricultural education and agricultural industry in general. Historically, the week of President George Washington’s birthday was designated as National FFA Week in 1947 at a National FFA board of directors meeting. According to responses to the National FFA Organization via social networking sites Twitter and Facebook, local FFA chapters plan to visit elementary and middle schools to talk to students about the importance of agriculture, stage local farmers’ markets and labor auctions, host teacher appreciation breakfasts, conduct Olympic-style competitions based on agricultural activities, perform community service projects and connect with state and local government leaders. Historically, the week of President George Washington’s birthday was designated as National FFA Week in 1947 at a National FFA board of directors meeting. National FFA Week always runs from Saturday to Saturday and encompasses Washington’s birthday, which is Feb. 22. 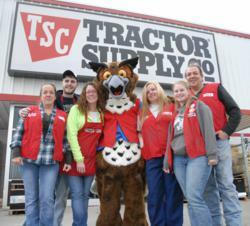 Tractor Supply Co., which operates more than 1,100 stores in 45 states, is conducting a Can-Do! Canned food drive contest. FFA members are asked to collect canned food and build a creative design with them, then post an image on the National FFA Organization's Twitter or Facebook accounts by 1 p.m. Thursday for judging before donating their items to a local food pantry. In Connecticut, Gov. Dannel P. Malloy proclaimed Feb. 16-23 National FFA Week in the state. National FFA officers will be active in six states during National FFA Week. The national FFA officer team of Clay Sapp, Wiley Bailey, Brennan Costello, Joenelle Futrell, Kalie Hall and Lindsey Anderson will meet with state and local government representatives, tour agricultural-related businesses, visit a host of high school and collegiate FFA chapters and participate in local National FFA Week festivities with local FFA members in Nevada, Vermont, South Dakota, Michigan, Louisiana and South Carolina. In Wisconsin, Waupaca High School’s FFA chapter will pack hundreds of meals for Kids Against Hunger on Friday. The chapter raised $10,000 to create 65,000 soy/rise casserole packages. FFA members will be joined by more than 120 volunteers to package 40,000 meals for distribution by Ruby’s Pantry, which provides food assistance to less-fortunate families in Wisconsin and Minnesota; 25,000 meals will be shipped to the Philippines. In Indiana, the National FFA Organization’s official mascot, Flyte the Owl, will make several appearances, including at Beech Grove High School to help FFA members thank teachers for their dedication to agricultural education, Lebanon Middle School to help local FFA members recruit new members, at Franklin Community High School during the week’s varsity boys basketball game vs. Jennings County on Senior Night and at several Tractor Supply Co. stores in central Indiana.